The Ben Hogan VKTR hybrid feature a 360º V-SOLE® design that improves turf interaction from every lie and incorporates a higher bounce leading and trailing edge for improved versatility and forgiveness. 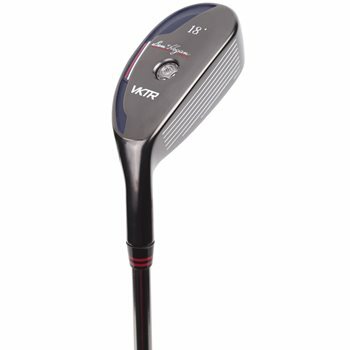 The VKTR hybrid also gives you the unparalleled ability to fine-tune the ball flight to fit your game. The advanced perimeter shot shape technology (PSST) allows the player to position 24 grams of weight around the extreme perimeter of the club head to favor the exact shot shape desired. These hybrids are designed to hold green better with your long range approach shots. Movable Center of Gravity technology with four interchangeable weights (one of 15-18 grams) allows the player to customize ball flight to properly fit any player. Tour inspired shaping and V-SOLE® technology in the golf club improves forgiveness in all turf conditions, and enhances the take-away performance. Larger impact zone across the bottom of the club face inspires confidence and dramatically improves performance. Redefined perimeter weighting is designed to be neutral in terms of left/right bias and delivers optimal launch and spin.